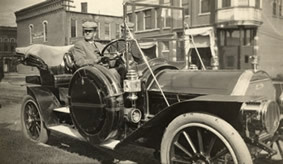 What does a 1910 Packard automobile have to do with the future of Mayo Clinic? The vintage car, along with costumed actors who represent some key figures in Mayo’s history, will be featured in a new film that will premiere during Heritage Days, Oct. 4-8. The film is called In the Words of Dr. Will: The Primary Value of Mayo Clinic. It’s sponsored by the Mayo Clinic Program in Professionalism and Ethics, with generous support from Whitney and Betty MacMillan and Gerald and Henrietta Rauenhorst. The film will be sold in Mayo-affiliated retail outlets starting Oct. 8. Like today, 1910 was a period of rapid transformation in medicine and society. That year, Dr. Will was invited to give the commencement address at Rush Medical College in Chicago. This film shows Dr. Will en route to the train station, talking over ideas with his colleagues, who ride with him in the car as they prepare for journeys of their own. The car stops at the Mayo family farm, where Dr. Will consults his father, Dr. William Worrall Mayo (played by Clyde Lund, who also portrayed W.W. Mayo in last year’s Heritage Days performance of A Leap of Faith). The movie was filmed at the Oliver H. Kelley Farm, a 19th century homestead near Elk River, Minn., owned by the Minnesota Historical Society. Based on research and told with humor and warmth, In the Words of Dr. Will shows that while much has changed, our commitment to teamwork in serving patients remains the heart of Mayo Clinic. Visit the Heritage Days web site for a brief preview of the film, as well as the Heritage Days schedule and more information. Then grab your goggles, button up your linen duster and get set for a ride into Mayo’s history! Feel free to click on the link to view a brief preview of the film. The following story was submitted by Matt Dacy, Mayo Clinic Development Office.